Competencies and behaviors are key concepts related to job performance and evaluation. 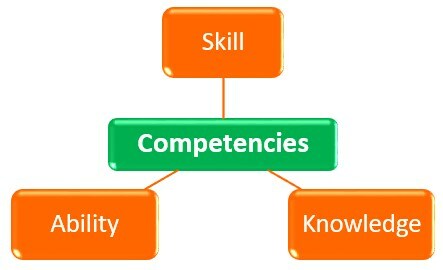 Competency – The ability to do something efficiently through a combination of observable and measurable knowledge, skills, and abilities of an individual. Behavior – The way a person acts or conducts themselves. Basically, a competency means the person can do the job functions, while a behavior means the person is doing the job functions. Competencies and behaviors are two concepts that directly influence each other. Behavior is the way a person acts or conducts themselves in their job role. In order to successfully perform their job role, a person needs the necessary competencies. These competencies can be obtained through education and training. However, even if someone is trained and has developed the competencies, that does not mean they will do the job successfully. There are other factors such as motivation, self-confidence, and resources that affect if and how well a person does his or her job. Behaviors can positively influence competencies. The more a person performs or behaviors in a manner consistent with the competency the more the competency develops. Hence, the more you do something, the better you get at it. A key difference between competencies and behaviors is that competencies are used for assessing potential employees, while behaviors are used to evaluate current employees who are actually performing the job functions. Employers often include competencies in a job description to convey the qualifications needed for a successful applicant. This also helps job seekers when giving consideration to a job posting. A competency is the ability to do something efficiently through a combination of observable and measurable knowledge, skills, and abilities of an individual. This combination enables a person to perform effectively in a job or situation. Knowledge refers to the factual and procedural information a person acquired through education or experience. It represents bodies of information that are applied directly to the work performance and job functions. Skills are developed proficiencies or dexterities in mental operations and/or physical processes used to effectively carryout activities or job functions. They stem from the proficient and effective use a person’s knowledge and abilities. Skills are learned or acquired through training and can be developed over time with exercises and practice. Abilities are the personal qualities or attributes of being able to perform an observable behavior. They tend to be innate traits that a person possesses or acquired without formal instructions. A behavior is the way a person acts or conducts themselves. Behaviors also are comprised of three main dimensions. Beliefs are often thought of as personal opinions regarding concepts, events, people, and things. However, beliefs are more than just opinions or feelings, they represent assurances or conviction developed over time. A person’s belief systems is built and developed upon his or her core values. Employees with personal beliefs and values similar to the company’s find it easier to integrate themselves within the organization and behave according to organizational culture. An attitude is a set way of thinking or feeling about someone or something. An attitude can predispose a person to respond positively or negatively towards a certain idea, person, or situation. It can significantly influence an individual’s choice of actions and behaviors. Action is the third dimension through which employees’ exhibit behaviors. Actions are the observable result of a person’s attitudes and beliefs. They are what we see the person do. 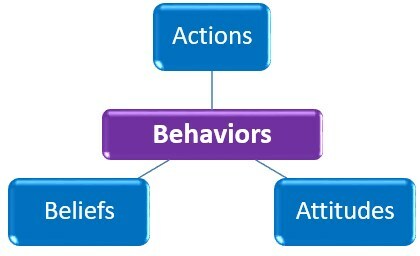 It is hard to see or measure a person beliefs or attitudes that affect behavior, but we can measure and evaluate action. In theory, if a person has the necessary competencies he or she should be able to successfully perform the job tasks. If they do not perform the job functions it may be due to a lack of motivation, resources, or belief, rather than a lack of knowledge, skill or ability.